You might think your small business tax preparation cost is adding insult to injury if you’re anticipating a big tax bill. On the other hand, a big tax bill means you’ve been profitable — that’s a good thing. However you look at it, it’s important to prepare for your tax costs before you file. For S corporations, partnership and multiple-member LLC returns, the tax filing deadline is March 15. If you’re a sole proprietorship, single-member LLC or C corporation, you’ve got until April 15 to file. With both sets of deadlines, you can push your filing back six months (to September 15 or to October 15) if you file for a tax extension, but you still need to pay the IRS at least 90 percent of your 2018 tax liability by the spring filing deadline. Now’s a good time to not only get ready to cover your potential tax bill but also to estimate the cost of preparing your return. What will your small business tax preparation cost add up to this year? History may be your guide — what did you pay last year? Your cost this year may be in the same ballpark. Last year’s costs may be a poor guide, however, if your tax preparation is changing this year. For example, the cost may change if you’re switching from using do-it-yourself tax software to paying a professional tax preparer. If you’re planning to use the same tax preparer as last year, but your 2018 tax return will be more complicated, you may also face higher fees. There are lots of tax preparation services on the market, including many online. Shopping around can help assure that you aren’t overpaying. According to the US Tax Center, the average charge is $761 for preparing a S corporation return, $806 for a C corporation return, and $590 for a partnership return. Also, keep in mind that you could come out ahead of the game by paying a tax professional rather than trying to tackle your tax returns on your own. That’s because a tax professional can help you identify tax-saving deductions and credits, and can minimize the risk of errors on your return. For example, suppose you inadvertently underpaid your tax bill by $8,000. The penalty could be one-half of a percent per month you are late (in some situations higher penalty rates may apply), plus accrued interest. So if the IRS calls this to your attention nine months after you file your return, you could have racked up a $360 penalty, plus interest. Filing with a professional can help you avoid tax penalties from mistakes on your return. Lastly, remember that the cost of tax return preparation is a tax-deductible business expense. If you opt to meet with a tax professional this year, be sure to organize the files needed to complete your return. If you just drop a heavy box of scrambled documents on the tax preparer’s desk, you can probably expect to see a higher fee. Time is money, as the saying goes. Most tax preparers give you a clear list of items they’ll need to prepare your return. You can also look at your 2017 tax return to refresh your memory. 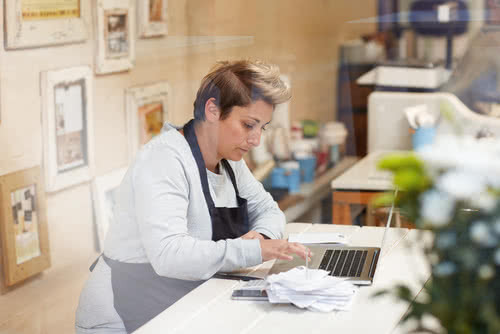 If you provide everything on the tax preparer’s list in a well-organized manner, that may help to keep your small business tax preparation cost within reason. You’ll need to have cash on hand to pay your 2018 tax preparation fees. These fees, as well as taxes owed, should be built into your next (2019) annual expense budget. If the time comes and your small business tax preparation cost is higher than you anticipated, don’t fret. There are steps you can take to get your budget back on track, and you can breathe a sigh of relief knowing your taxes are done.